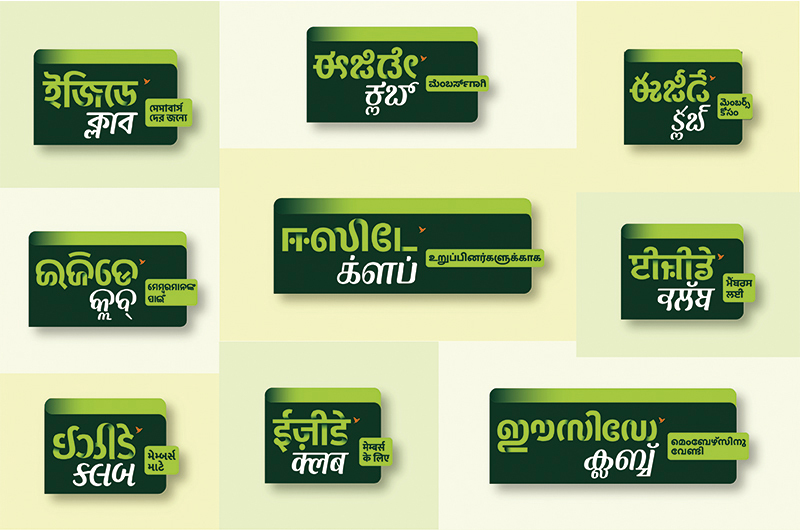 Future Group’s retail chain of neighbourhood grocery stores was expanding into a new format, and needed a revamped identity to go with it. EasyDay stores already existed in many locations, but were now going exclusive. We were invited to design their new brand identity, along with the retail layout and principles, and we got right onto the mammoth task! EasyDay was a regular neighbourhood convenience store, with a small-sized self service system. It was being turned into an exclusive members-only benefits club, offering a hyperlocal community shopping experience to its customers. Connecting nearby services and amenities, it was to be a one-stop-shop to meet all needs. The logo needed to incorporate the EasyDay name, associated with savings and a friendly neighbourhood store. Our team put their heads together and we decided to use the concept of a wallet to signify savings. Lower case letters showed approachability and the ribbon-like texture lent it a contemporary look. In the spirit of building local connect, we developed the logo in multiple scripts to align with the visual identity. The logo can be implemented dynamically according to the usage. We developed a library of icons, covering different categories of products in one style. These formed a recognisable part of the visual identity of the brand and were used extensively, especially in the EasyDay Fresh stores which were not member-exclusive. The icons were monochromatic and blended with a chalkboard treatment. All of the visual communication was built around the idea of community and helping farmers by buying locally sourced fresh produce. Freshness was a big part of the brand and was incorporated on the store fronts as well. The colours used were bright and clean, lending a refreshing look to the stores. The new-formed identity was manifested on a range of materials. These included posters, staff uniforms, club cards and membership kits. Stores have since been opened to the public, receiving a good response. Future Group has spoken about plans to expand EasyDay Club stores to 10,000 nationwide by 2022.